Another game we played at our most recent game night was Turnspell released by Mattel in 2016. 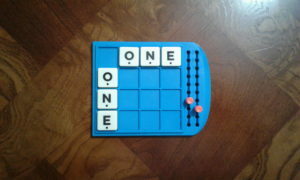 This is a word game where 2 to 4 players are scored based on their ability to construct four letter words. Contained with the game are four, four-by-four letter boards for each player with scoring pegs and a center spinning board which contains letters chosen randomly from a pouch. 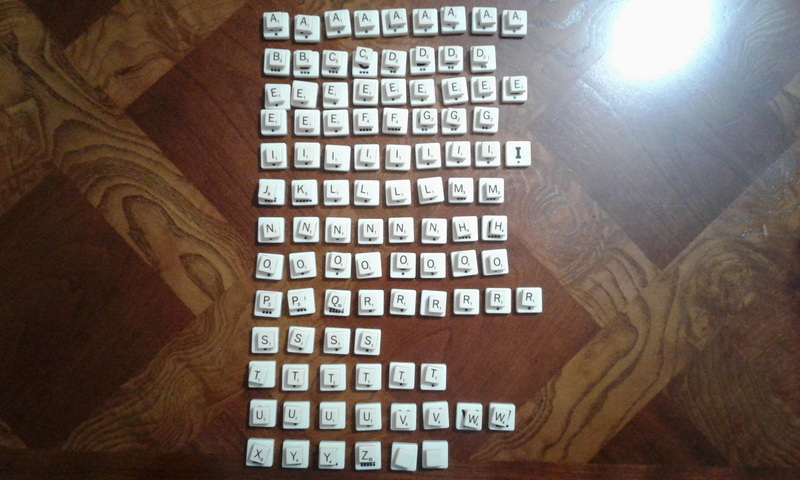 The pouch contains tiled letters with the exact same frequency and score values as Scrabble. I was actually disappointed to discover I am missing an “I” from my favorite travel Scrabble set when I tested the theory that these games use the same lettering system. Mattel, I think you may owe Hasbro an explanation, or at least a concession that they know what they are doing more when it comes to word games. 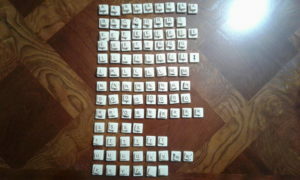 Scrabble and Turnspell tiles match up perfectly. Letters are chosen at random and placed on the center spinning board, filling each of its four four-letter tile spaces. When we started the game we thought you were supposed to spin the spinning board to determine who started with which letters. Don’t do this unless you want pick the letters up off the floor on opposite sides of the room. Try to make the letter setup truly random so no one feels cheated in the first turn. When we started one game, one of the sides of the center spinning board was completely filled with “E” letter pieces. Given that there are rare letters that are worth more points and common letters that are quite prevalent, my friend was forced to take an “E” on his first turn while his opponents were taking “J” and “X” letters. Perhaps a mulligan system could be employed to provide a more balanced start for all players. 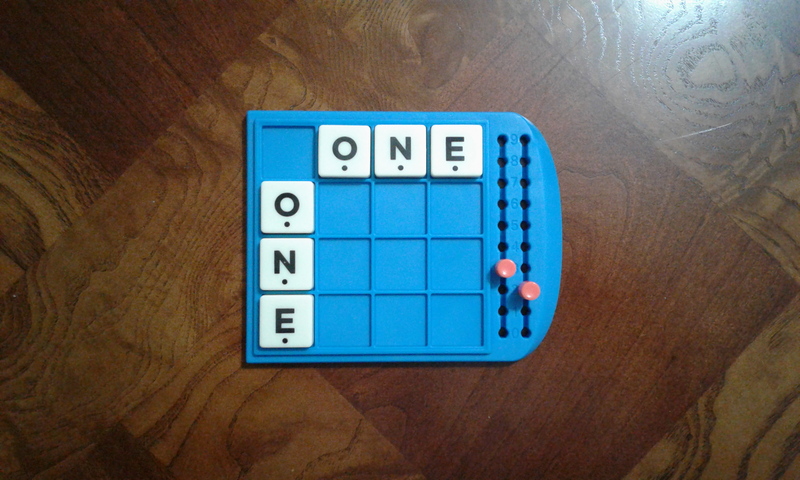 I would suggest if a side on the spinning board is completely filled with one-point vowels, or perhaps only one-point letters (vowels or consonants) at the beginning of the game, one letter should be traded out until a higher point valued letter is drawn to take its place. Center spinning board. Be careful when spinning. All players play simultaneously. Each player draws a letter and places it somewhere on their player board. The player’s objective is to create four-letter words on their board. Once a four-letter word is created, it is scored by counting the point value each of the letters is worth. 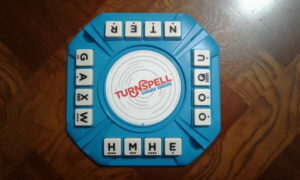 The word’s total score is added to the player’s score total using the pegs on the player’s board and the letters from the word are then placed back into the letter pouch. There is a possibility for a player to use a letter to create two four-letter words at the same time. When this happens, the letter values from both words are added together and then that final sum is doubled to compute their total score for that turn. When a player reaches a score of 44, they win the game. If two players surpass a score of 44 in the same turn then the highest scoring player wins. If both players tie past 44 in the same turn, I assume they must fight to the death or the universe explodes. The rules do not specify in this final case. Once a tile is placed on a player’s board, it cannot be replaced without taking a penalty. If a player wishes to remove one tile, they may surrender five points or twice the point value of the letter to do so, whichever total is higher. If they do not have enough points in the game to take the penalty, they may not remove the tile. When a tile is removed, it is placed back into the letter pouch. It cannot be replaced on the player’s board. A player board. All she needed was a “Z” and I took it before she could get it. The player may also remove an entire row of tiles from their player board for no penalty. If there is only one tile in the row, it may be removed with no penalty. Similar to removing the one tile, if a row is removed from a player’s board it is removed to the pouch, not rearranged on the player’s board. 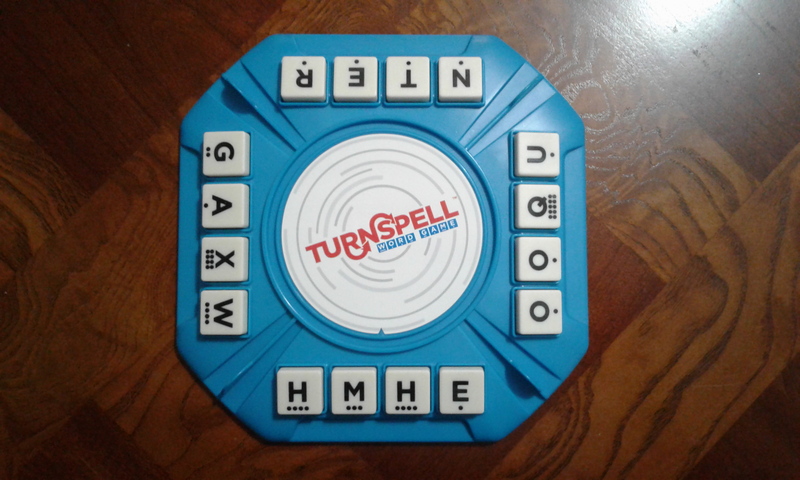 Once all players have placed a tile on their player board, the center spinning board is turned one-click clockwise so that the next set of letters is facing a new player. Then the missing letters from the previous round of play are replaced at random from the letter pouch. 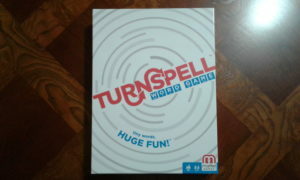 Turnspell is a good word game for board gamers who are not good at word games. I never win at Scrabble. I only ever really play it because other people enjoy it. I won at Turnspell against people who enjoy Scrabble and win often at Scrabble. It felt good, but also felt like sort of a cheap thrill for me while playing with such Scrabble aficionados. This is a nice light party game that takes a lower vocabulary and less brain activity than other word games in its class. This entry was posted in 2 Player, 2 Player Competitive, 2016, 3 Player, 3 Player Competitive, 4 Player, 4 Player Competitive, Board Game, Board Game, BRD-0006, C50/S50, Game Review, Mattel, Mattel, Word Game. Bookmark the permalink.